Recently, I’ve been spending quite a bit of time trying to identify and profit from bad favorites. The logic is this: If a handicapper can eliminate a horse that controls 30-40 percent of the win pool (typical for most favorites), he/she can theoretically make money simply by betting — in proportion to their odds — every other horse in the field. This method of play, known as “dutching,” is said to have been invented by the infamous gangster Arthur Flegenheimer, a.k.a. Dutch Schultz, in the 1930s and was especially popular when bookmakers still ruled the racing world. Today, at least in America, where pari-mutuel wagering has become the standard, dutching is all but impractical save for rare instances. Plus, let’s be honest, Dutch Schultz and his ilk undoubtedly knew when a certain horse or horses would lose (my guess is they were able to, uh, "persuade" owners/jockeys to help them achieve their goals rather easily). These days, horseplayers typically don’t have that luxury; we must deal in probabilities. 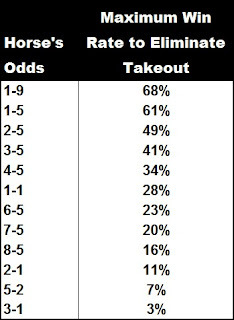 What this table shows is the maximum success (win) rate horses at the specified odds can achieve in order to wipe out both the takeout and breakage (based on a 122 percent pool). Anything below the listed percentage means that a dutch of all the other runners would result in profits, while anything above the listed percentage entails an incrementally greater house advantage. For example, if one were to discard all 6-5 favorites from win consideration, those horses would need to lose at least 77 percent of the time, on average, for one to eliminate the track takeout and breakage. That’s no small feat given that such horses, as a whole, typically win around 40 percent of the time. However, it can be done. 1) Horses ill-suited to today’s surface/pace requirements. Holdin Bullets may have been the most terrible favorite in the history of terrible favorites when he went to post as the 2-1 betting choice in the 7th race at Kentucky Downs on Sept. 10. Not only was the Wesley Ward-trained three-year-old coming off of an extended vacation, he was also going a distance of ground for the first time in his life and trying a new surface to boot. Now, look at his pace figures and remember that turf races — especially turf races at Kentucky Downs, which has many characteristics of a European course — typically require moderate early speed rations (ESRs), strong late speed rations (LSRs) and a positive Pace Profile. Holdin Bullets shows just the opposite — a ridiculously fast ESR (-17), a horrible LSR (-22) and a negative Pace Profile (-78 degrees) in his last race. On Monday, the son of Ghostzapper set the pace for half a mile and faded steadily thereafter; he finished dead last, beaten by 31 lengths. 2) Animals that don’t rank highly in any of the major handicapping categories — speed, class or form. Due to the conditions, the fourth race at Delaware Park on Sept. 12 matched hard-knocking multiple winners versus younger, more inexperienced foes. Ice Pilot was among the latter. Seven of the nine entrants had more career wins than the son of Smart Strike and several had superior earnings (and earnings per start) as well. What’s more, Ice Pilot was coming off a dull sixth-place finish at Monmouth Park, albeit against better, just 20 days ago. At even odds, he was the very definition of an underlay. 3) Entrants with moderate credentials that are getting bet like they are Secretariat. When I saw Runaway Court was 2-5 on the morning line in the 7th race at Remington Park on Sept. 13, I was flabbergasted… and immediately began salivating over the prospect of a negative show pool. Sure, Runaway Court looked like a contender in the one-mile maiden claiming event — she was dropping drastically in class and sported top-notch connections — but she had never before raced on dirt (see rule 1) and was being bet like she was Rachel Alexandra. The daughter of (grass-loving) Powerscourt went to post at her morning line of 2-5 and was trounced by 34 ¾ lengths. I know this is an older post but hope you get a chance to respond. I've only been following the sport for a little over a year, so I'm still casting a wide net on an approach that works for me. I'm really intrigued by the approach of eliminating favorites, but dutching all remaining horses seems like an inelegant (and probably losing) proposition. Since your a numbers guy, I'd be interested to know how many horses one would need to eliminate from a field to eliminate the house edge. Obviously this depends on the odds of the horses, so actually what I'm asking is after I've eliminated the favorite, what is the maximum amount of the pool that can be represented by my contenders to do the same thing assuming 100% accuracy on my part. 80%? 50? 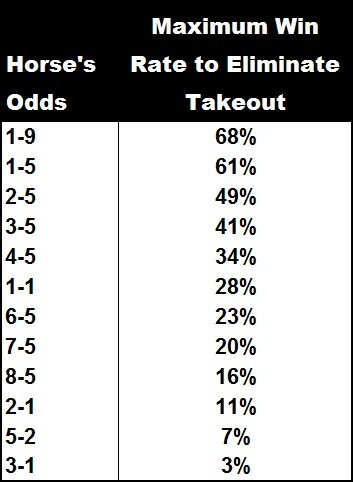 S= Sum of the eliminated horses' odds. For example, if you toss a 3-1 shot and an 8-1 shot, S equals 0.361 (0.250 + 0.111). So, using the example above, the MSR would be 85.9%.